From 16 till 20 March 2015, the Office for Public Play led the workshop “City of Children” at the master Child Culture Design of HDK, School of Design and Crafts in Gothenburg. The Office for Public Play was invited by Markus Olof Bergstrom of HDK to organise the workshop as part of the master course “Mobility and Play”. 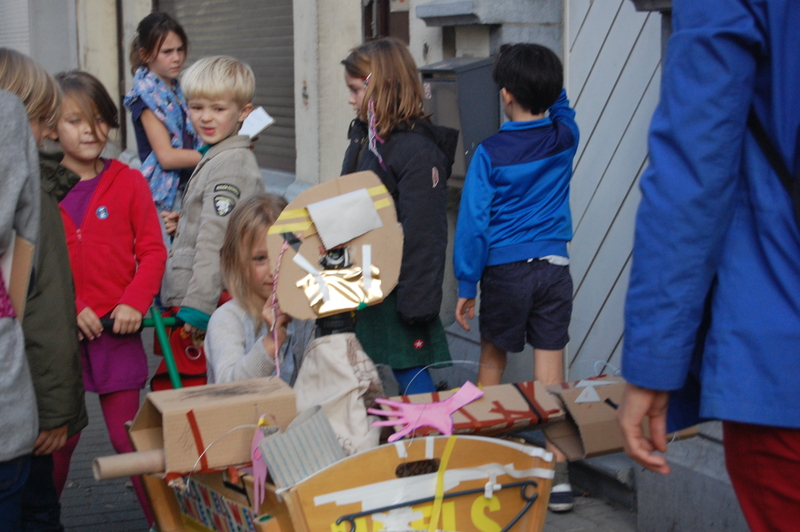 The workshop interpreted mobility as a way to research the spectrum of children’s freedom to play in the city. What is the freedom of moving, action and play for children living in the city of Gothenburg? What is the relation of public spaces within this? and, Can this freedom include levels of adult’s supervision? 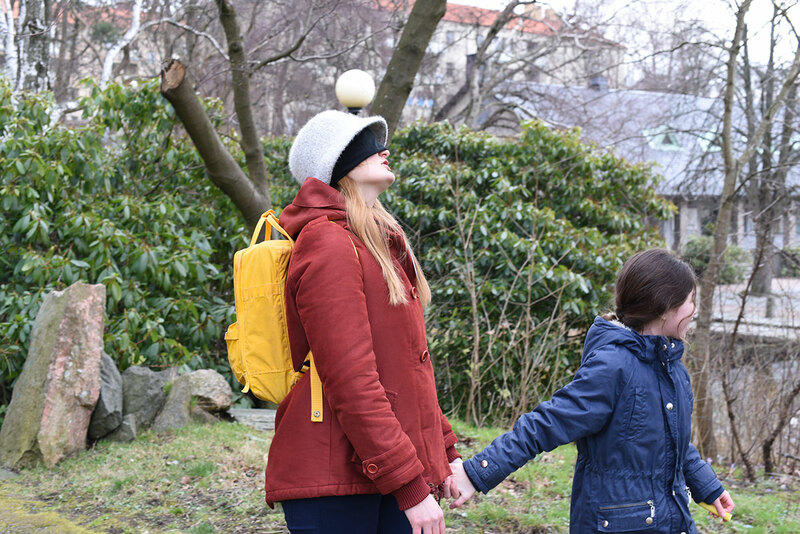 The master students were asked to design a playful guided tour that gives the participating audience an insight on the child’s freedom to move, act and play in the city of Gothenburg. The guided tour gives a child perspective and was therefor co-designed with a group of children from the 4th grade (10 years) from ISGR, the International School of the Gothenburg Region, located in Guldheden, Gothenburg. 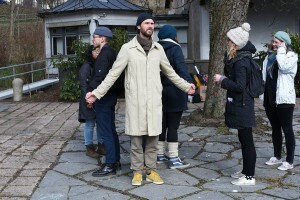 Each day commenced with “Public Time”, a play time session, performed by all master students in public space. The play activities were inspired by Augusto Boal’s Games For Actors and Non-Actors. The students prepared for the co-design session by defining a method and developing cultural probes to facilitate the collaboration. A sensitising exercise is given to the child group in advance. 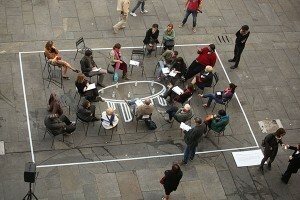 The co-design session took place at Guldhedenstorget square, to learn from working in the real context of public spaces. The master students took the material gained from the co-design session as a base to design their playful guided tour that was finally presented on the square on Friday afternoon. This artistic workshop attempted to develop critical thinking by children on public space matters. The five-day workshop took place in October 2014 and was hosted by WIELS, Contemporary Art Centre, Brussels. It was organized by Annelies Vaneycken (designer/researcher) and accompanied by Michael Kaethler (sociologist/design researcher). Eleven children, aged 6 to 11 years old participated. What does a child think of public space? What are their opinions, what do they like or dislike, and do they have a voice to articulate this? The 5 day workshop aimed to explore some of these questions by working with children and experimenting with a variety of pedagogical and design techniques such as non-linear structures of adaptability, deconstructing the pedagogue, and radical play. A number of tools were experimented with, most notably a self documenting sculpture collectively christened Mr. Wiels. This sculpture fostered inward and outward reflection on the children’s experience of the public sphere through being constantly co-created vis-à-vis discussions on and experiences of public space. The sculpture was constructed, both physically and ontologically by the children, using common materials, stories, and dialogues, which resulted in a co-constructed character, complete with passport, life story and personal interests. As the children created and subsequently toured Mr. Wiels through the streets of Brussels, they relayed their narratives of city-life, objects, memories, moments, questions and so forth to him, exploring their own lives through the artifact and with each other. The shared artifact mediated the individual and communal experience, taking the attention away from the designer/pedagogue by allowing the artifact to guide the process. This provided a rich experience for the children as well as a repository of data to be used by design researchers looking at child-centred design. The first TRADERS Summer School started with an official Kick-off at Z33, the 31st of September, when the results from the Training Week and first TRADERS exhibition were shown to all the participants. The 1st of October we had a lecture from Ramia Mazé, who gave many insights and examples of ‘disruptive’ approaches to participatory practices in design, and guided the participants divided into 6 groups on a workshop during the afternoon. The 2nd of October Martijn De Waal gave a lecture on the ‘playful’ approach and guided the groups to finalize their proposals to ‘prototype’ in public space. The 3rd of October we had the morning to finalize our proposals and videos and in the afternoon organized a ‘public forum’ to show the results from the different projects realized and reflect on different issues dealt with during the past days. Social, economic and environmental changes ask for a rethinking and repositioning of designers and artists in society. 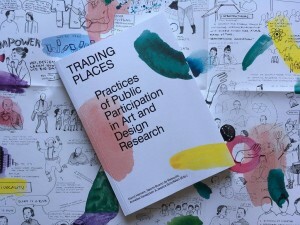 In this line of thought, the TRADERS project questions how designers and artists can engage people to participate in the debate about, and the construction of, public space. The project also aims to develop tools for training future art and design practitioners and researchers in doing so. Six design and art researchers investigate specific participatory approaches in public space (play, intervention, mapping, data-mining and modelling in dialogue), which eventually will result in a framework for training. *The Summer School is open to external participants who have previously followed the application procedures and were selected to join. 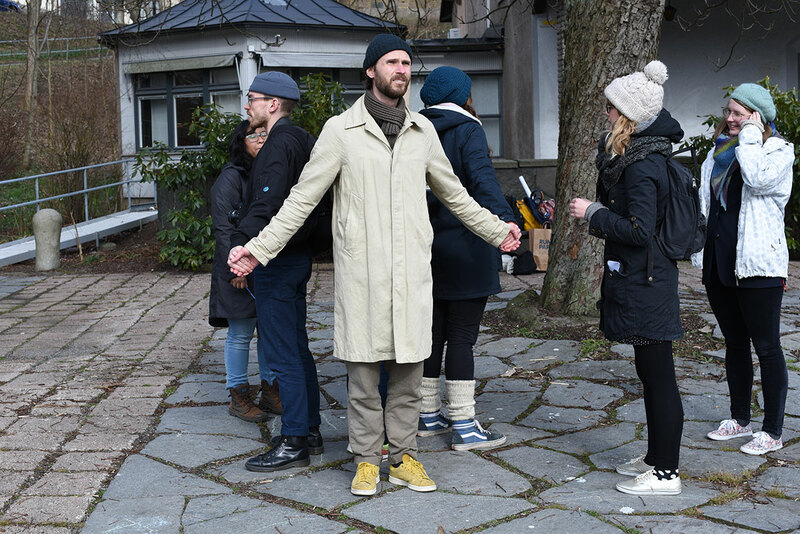 This Summer School attempts to take a first step in investigating this question, by exploring the power relations involved in working in participatory ways in public space. A series of workshops will embark in creating approaches and tools for (training) artists and designers in dealing with power relations in participatory set-ups. We will explore approaches and tools on two sides of a spectrum. On the one hand, in a disruptive approach, the role of the designer or artist could be to engage people in a practice of questioning power relations. For instance, Carl DiSalvo (‘Adversarial Design’, 2012), referring to Chantal Mouffe, sees a role for designers to construct an agonistic public sphere of contestation where people can be confronted with alternative positions. On the other hand, a ludic (or playful) approach distances itself from the explicit references to the power relations at stake by using playful, game-like set-ups. Exemplary for this approach, the Dada-movement or the ‘Situationist International’ were a reaction to a political or socio-economical situation, but responded to it using coincidence, play or collage. *The program of the Training Week is closed to the members of the TRADERS project. The first training week of TRADERS project will take place in Genk, from the 27th to the 30th of September. It develops around the approach of intervention as a participatory practice, discussing and exploring the relation and – on the first sight – opposition between the concepts of intervention and participation. This week takes place in the area of Hasselt-Genk, with its host institution being LUCA School of the Arts (KULeuven). Throughout five days, we attempt to deconstruct and evaluate the process of producing a ‘participatory’ intervention, and work with the expertise from the LUCA School of Art (KULeuven) partners.